After fulfilling thousands of catering requests from 30-3000, we've got the team to make your event a success! If you love the Buns food in the restaurants, you'll love it just as much at your next event. 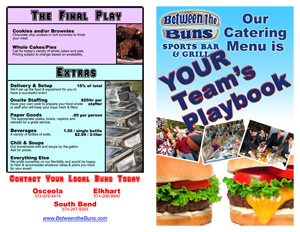 The Buns is ready to cater your next party, business lunch, celebration, tailgate or other event at your place or ours! You can pick your order up at any of our restaurants or we can deliver (for a nominal fee). We can also provide equipment, staff, paper goods or any number of things you might need to have a great event. Check out our menu below and give us a call! Click the pics to open our catering menu. Please note: These are simply suggestions. 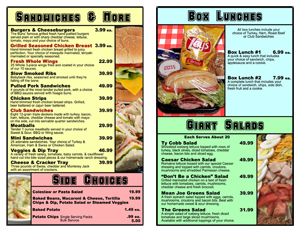 We can custom build your menu to suit your needs from tailgating to informal to formal. Your event, your vision, OUR specialty! They are also catering masters! Call today to speak to an expert!